Sometimes a picture can speak a thousand words. Today, I’m going to share (with permission) a before and after picture of my client’s business space at Alamo Heights Wellness in San Antonio, Texas. I helped Patrica Lew, L.Ac and NAET practitioner redesign her office and transform her business into a relaxing and friendly space that has taken her business to the next level. 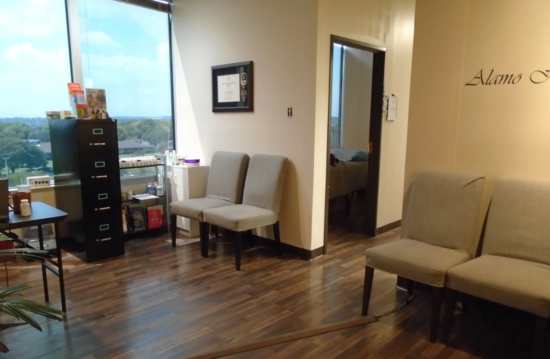 The office went from feeling cluttered, disorganized and average to professional, welcoming, relaxing and a memorable place her patients now LOVE visiting. I was thrilled to hear this from Patricia! This is why I do this work. Based on case studies I’ve done over the past 15 years of doing this work, I’ve seen healthcare and wellness business triple their income with higher patient retention and referral rates. If you’ve been on the edge of redesigning your wellness space or are now feeling the springtime call for a new paint color, my healthcare design books can help guide you through the process.